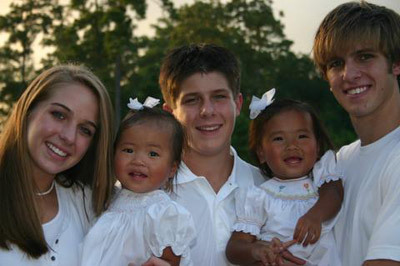 Now to Him who is able to do IMMEASURABLY MORE...: Summer 2006- Ellie makes 7! If someone had told me just a few years ago, that in 2006 we would be bringing our second daughter home from China to become a family of seven, I’d have laughed! I was myself from a family of seven, and even while in the midst of it, wondered how my mother held it all together. One of my closest friends had three children very close in age to my own three, but for several years after I thought that I was “finished having babies”, she delivered 3 more! I can’t count the times that I declared that God had somehow made her “different” than He had made me- I couldn’t handle such a family! How God must have laughed from heaven at such declarations, …knowing what He had in store for ME in the years ahead! It seems a lifetime ago since meeting Ellie for the first time in the Changsha Civil Affairs Office. Thankfully, that first painful week together seems such a distant memory now, in light of the happy little girl she has become! She is hardly the same little girl and has made such an incredible adjustment into our family! If I had not witnessed this beautiful miracle with my own eyes, I would not have believed it myself! We have traveled hundreds of miles by car and by plane since arriving home in early June. I totaled our driving time after one of those trips and I figured that the girls had spent at least 37 hours buckled into their car seats over a two week period. Whew!...That is a lot of traveling when it includes two 2 year olds! But Kate and Ellie have been angels…sleeping in so many different places, and visiting with so many old friends over lengthy meals on the road…all without complaint from either of them. I entered this adoption very cautiously, knowing that the odds of getting another “angel” like Kate were slim. Praise God,…He is not a God of “odds”! I have been so incredibly blessed; I am humbled by the mere thought of it on a daily basis! 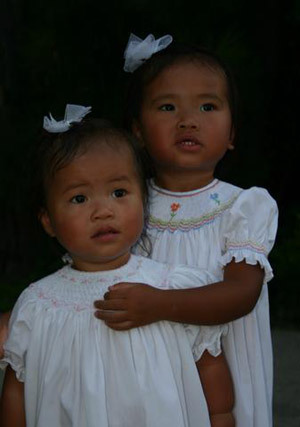 I am convinced that if there were only two angels in China, I got both of them! I regularly feel embarrassed by the lack of faith I displayed in this area. Unfortunately, Ellie’s first month home was not her healthiest. Our entire family battled a stomach virus and upper respiratory infections while away from home in June and July. This meant a very traumatic visit to a pediatrician in my home town for Ellie, following two days of very high fever that we could not bring down. The poor baby had to have her ears cleaned out so that they could see her eardrums, was catheterized, had three vials of blood taken from her arm and then had to be held down for chest Xrays before it was finally over. She is feeling much better now, but has developed quite a dislike for anyone in a white coat coming toward her with any kind of medical instrument! So much so, that our ENT actually had to put her to sleep to clean all of that wax out of her ears, after she did not pass a hearing test to his satisfaction. But she has been an absolute doll through it all! Little does she know that her time with those “people in white coats” has just begun! The Shriner’s Hospital here in Houston has accepted Ellie as a patient and we had our first visit with their hand surgeon last week. They will do surgery to release the amniotic band sometime in the next few months. Then we will wait and see what can be done to make her hand more functional as she grows up. They will also provide a prosthetic hand for her when she gets a little bit older that she can wear whenever she chooses. Because we don’t have insurance to cover these expenses, all of her care there will be free of charge. Once again, the Lord has graciously provided everything we have needed for Ellie. I look forward to the day when I can tell Ellie what a wonderful Father she has… How visible His hand has been in her life already! With every new day I am falling so much in love with Ellie that I think I might explode! It reminds me of being pregnant for the second time and being fully convinced that I could never love another child the way I loved my first, only to discover that there is more loved welled up inside of me than I could have imagined! My emotions for Ellie have proven this true yet again and I am enjoying watching her grow and blossom into such a precious little girl, so perfectly fashioned for our family! This summer has not been an easy one, though, and I find myself completely exhausted following four separate viruses for me and the kids, along with the adjustment of adding another toddler to our home. Caring for two 2 years olds is a lot of work no matter how you look at it, especially when combined with three very busy teenagers! Even so, I am saddened to think about packing Russ’ things and driving him to college next weekend. It seems just yesterday HE was only two years old! This gives me a new perspective on how fleeting these toddler years are, and I am determined to enjoy every moment of them with Kate and Ellie! We “forced” everyone to take some time for our last photo session as a family of seven all living under one roof. Just looking at those photos now brings tears…How blessed I am to have been entrusted with five beautiful children! I could not have imagined it 19 years ago…but I wouldn’t change it today for the world! I thank the Lord for leading me places I would not have taken myself to show me how rich life can be when I follow His plan! I feel caught up in an incredible story I could not have orchestrated myself and am daily blown away to love and serve such a God as mine!